William Douglas Hamilton was born in Lanarkshire, Scotland on May 24, 1832. He immigrated to the United States with his parents and two siblings six years later, and the family settled on a 200-acre farm near Newark in Licking County, Ohio. Two uncles had had settled in Ohio three years earlier, and parents followed their brothers to America, settling in a a Scottish enclave that developed along the National Road in Central Ohio. As a youth, he worked on the farm and then taught school to earn his way through college and then law school. He graduated from Ohio Wesleyan College in Delaware, Ohio and from the Cincinnati Law School in 1859. He then established a law office in Zanesville and practiced law until the outbreak of the Civil War in 1861. When Fort Sumter was shelled in April 1861, Hamilton was recuperating from typhoid fever. He immediately decided to enlist. Abandoning his law practice, he raised the first company for three years’ service in that part of Ohio, and was assigned to the 32nd Ohio Volunteer Infantry as captain of Company G. He served in the West Virginia and Shenandoah Valley campaigns of 1861 and 1862. Fortunately, he was at home in Zanesville on recruiting duty when his regiment surrendered to Maj. Gen. Thomas J. “Stonewall” Jackson’s troops at Harpers Ferry in September 1862, so he avoided that disgrace. In December 1862, Ohio Governor David Tod directed Hamilton to recruit the 9th Ohio Cavalry. The regiment was organized in 1863 for three years’ service. The first four companies mustered in at Zanesville in January 1863, and it took until September, October, and December for the remaining eight companies to be mustered into service. The first four companies were organized as a battalion and placed under Hamilton’s command. The regiment was finally completed and united in Alabama in early 1864. Hamilton was originally commissioned as a major of the new regiment, earning promotions to lieutenant colonel in 1863, and finally to colonel later that year. He was known as an officer who “takes great care of his soldiers” and who “does not let them suffer.” Two brothers, Robert and Henry, also enlisted in the same company and were killed during the war. 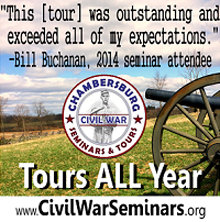 The 9th Ohio Cavalry served honorably in the Atlanta Campaign, the March to the Sea, and the Carolinas Campaign. 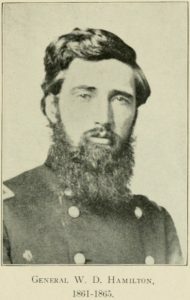 In particular, Hamilton and the 9th Ohio served critical roles in the December 4, 1864 Battle of Waynesboro, Georgia during the March to the Sea, and at the February 11, 1865 Battle of Aiken, South Carolina, where a cousin, Lt. Arthur Hamilton, the regimental adjutant of the 9th Ohio Cavalry, was mortally wounded. In all, William D. Hamilton served one year in the infantry and then three years in the cavalry during the course of the American Civil War. Among the battles he participate din were Cheat Mountain, Decatur, Buckhead Creek, Waynesboro, Aiken, Averasboro, and Bentonville. He was brevetted to brigadier general of volunteers for “gallant and meritorious service rendered during the campaign ending in the surrender of the insurgent armies of Johnson and Lee” upon recommendation by Sherman and Judson Kilpatrick. Bvt. Brig. Gen. William D. Hamilton late in life. After the Civil War, Hamilton abandoned the practice of law and became an industrialist in the coal and iron business. He successively was president of a rolling mill company located in Newark, Ohio. He organized and served as treasurer of the Newark, Somerset and Shawnee Railroad, which was later purchased by the Baltimore and Ohio Railroad. 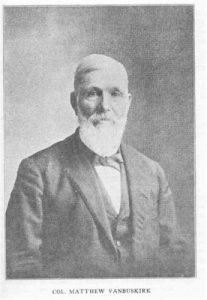 He then served as president of the Ogden Iron Company at Orbiston, Hocking County, Ohio, which later merged with another company. Then, he acted as president of the Hamilton Coal and Iron Company, operating in Athens County, Ohio. Finally, his last role was as president of the Southern Slate Company. Hamilton was a Republican, a member of the Wells Post, G.A.R., in Columbus, Ohio, the Military Order of the Loyal Legion of the United States, and the First Congregational Church in Columbus. He published a well-regarded memoir of his wartime service in 1915 titled Personal Recollections of a Cavalryman After Fifty Years. Hamilton married Sarah Cheaver Abbott of Zanesville in 1866. The couple had two daughters, Mrs. C. E. Gillette, wife of Major Gillette of Philadelphia, and Mrs. Charles E. Sudler, of Chilhowee, Tennessee and two sons, William E. Hamilton of Columbus and Charles R. Hamilton of Cleveland. His grandson, Douglas Hamilton Gillette, was a member of the West Point Class of 1915, and Hamilton dedicated his memoir to his grandson. Hamilton died in Columbus, Ohio on January 22, 1916, and was buried in an unmarked grave in Greenlawn Cemetery. Sarah Hamilton died in 1920 and was buried alongside her husband. She also rests in an unmarked grave. The Central Ohio Civil War Roundtable has made the marking of General and Mrs. Hamilton’s graves a group project. We hope that it will come to fruition during 2018, as this forgotten horse soldier deserves recognition for his honorable service during the Civil War. Here’s to William Douglas Hamilton, forgotten Ohio cavalryman. It’s been a very long time since my last post, and even longer since my last Forgotten Cavalrymen profile. 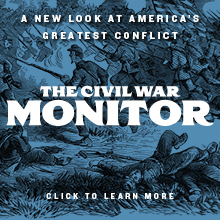 I’ve been working on the February 11, 1865 Battle of Aiken, South Carolina, which will spur several of these profiles. 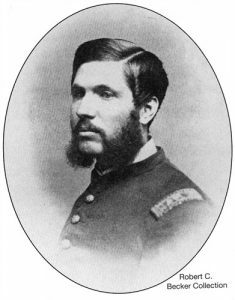 Here’s the first one, of Lt. Col. Matthew Van Buskirk of the 92nd Illinois Mounted Infantry. Matthew Van Buskirk was born in Buckmantown, Clinton County, New York, on January 1, 1835. He was the son of Lorenzo Dow Van Buskirk and Louisa Van Buskirk, and had one brother, Albert, born March 20, 1841 (Albert Van Buskirk was killed in action at the Battle of Drury’s Bluff near Petersburg, Virginia on May 16, 1864). After completing his education, the young man relocated to Illinois in 1851, and was still living there with the coming of war in 1861. Capt. Matthew Van Buskirk, 1863. He enlisted in the 92nd Illinois Volunteer Infantry, which was organized at Rockford, Illinois, on September 4, 1862, and was quickly elected captain of Company E. The 92nd Illinois consisted of five companies from Ogle County, three from Stephenson County, and two from Carroll County. The newly formed regiment left Rockford, 11 October 1862, with orders to report to Gen. Horatio G. Wright, in command of the defenses of Cincinnati, Ohio. The regiment was assigned to Gen. Absalom Baird’s Division of the Army of Kentucky. These men soon marched into the interior of Kentucky and was stationed at Mt. Sterling in October to guard against rebel cavalry raids during Braxton Bragg’s invasion of Kentucky. Later, it was assigned to Danville, Kentucky. On January 26, 1863, Baird’s division, including the 92nd Illinois, was transferred to the Army of the Cumberland. The division was assigned to serve in Franklin, Tennessee, and assisted in the pursuit of Maj. Gen. Earl Van Dorn’s Confederate cavalry raiders. They advanced to Murfreesboro,and occupied Shelbyville, Tennessee on June 27, 1863. The 92nd Illinois Infantry converted to mounted infantry on July 22, 1863 and was rearmed with Spencer repeating rifles. It was then assigned to join Brigadier General John T. Wilder’s Lightning Brigade for the rest of Maj. Gen. William S. Rosecrans’ command of the Army of the Cumberland. During the early phases of what became the Chickamauga Campaign, with the Lightning Brigade leading Rosecrans’ advance, the 92nd Illinois crossed the mountains at Dechard, Tennessee, and took part in the movements opposite and above Chattanooga. The 92nd Illinois then crossed back over the mountains and joined Maj. Gen. George H. Thomas at Trenton, Alabama. On the morning of September 9, the Lightning Brigade led the Union advance to Chattanooga, helping to drive the Confederates from Point Lookout. The 92nd Illinois then entered Chattanooga, unfolding the Union banner on the Crutchfield House. They then pursued the retreating Confederates. Brig. Gen. Nathan Bedford Forrest’s Confederate cavalry attacked the Lightning Brigade near Ringgold, Georgia, inflicting significant casualties on the Federals. At Chickamauga, the 92nd Illinois supported Maj. Gen. Joseph J. Reynolds’ Division of Thomas’ 14th Corps. In April, 1864, the 92nd was doing picket duty at Ringgold, Georgia. On May 7, 1864, the 92nd Illinois, which had now been converted to light cavalry and armed with cavalry weapons, began Sherman’s Atlanta Campaign as part of Brig. Gen. Judson Kilpatrick’s Third Cavalry Division. The 92nd Illinois participated in the Battle of Resaca, Kilpatrick’s failed raid around Atlanta, as well as the Battles of Bethesda, Fleet River Bridge, and Jonesboro, where the regiment lost one-fifth of the men engaged. The regiment moved from Mount Gilead Church, west of Atlanta, on October 1, and took an active part in the operations against Hood’s army, including taking heavy losses at Powder Springs. About this time, Van Buskirk was promoted to lieutenant colonel of the 92nd Illinois after Col. Smith D. Atkins was promoted to brigadier general of volunteers and assumed command of a Federal cavalry brigade. The 92nd Illinois then participated in the various engagements and skirmishes in Sherman’s March to the Sea and then through the Carolinas Campaign of 1865. During its term of service, the 92nd Illinois participated in some forty battles and skirmishes. The regiment was mustered out at Concord, North Carolina, on June 21, 1865, and was then discharged at Chicago, Illinois, on July 10, 1865. 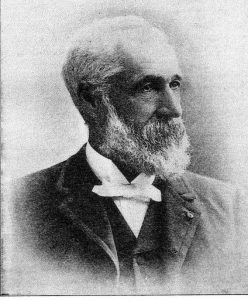 Lt. Col. Matthew Van Buskirk later in life. Van Buskirk “was popular with his soldiers and trusted by his superior officers,” noted one biographer. 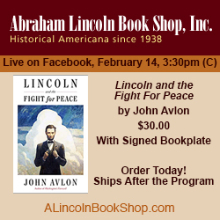 With the end of the war, he settled in Iowa Falls, Iowa, where he successfully operated a store selling boots, shoes and crockery and later dry goods and other items, growing his business into a general merchandising business. Later, he became a gentleman farmer. He married Nellie C. McGiven in 1866, and they had seven children together. Van Buskirk died on January 10, 1901 and was buried in Iowa City’s Union Cemetery. “He was a clear-brained, noble-minded man of action and his life record is worthy of emulation by the youth of this locality whose careers are yet matters for the future to determine,” declared his biographer. Here’s to forgotten cavalryman Matthew Van Buskirk, who performed his duty capably and with honor throughout the American Civil War.